Whether you roast your own after scooping out a pumpkin for pie or Halloween decorating, or if you buy them at your local grocery store—pumpkin seeds offer a wealth of health benefits that are often overlooked. 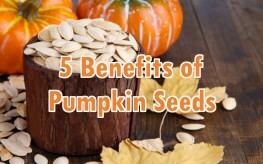 Other seeds may get more attention, but pumpkin seeds are rising in popularity as their health perks are uncovered. Rich in antioxidants and minerals, these seeds are versatile. They can be added to salads and stir-frys, as well as eaten raw or thrown on oatmeal. Chopped finely, they can add texture and flavor to baked goods while ramping up the nutritional value. 1. Rich in zinc – Pumpkin seeds have more than 2 mg of zinc in every single ounce. Zinc is important for several reasons, but most notably for its impact on your immune system. Without enough zinc, you can suffer from more colds and the flu, from depression, acne, and even chronic fatigue. 2. Good for your heart – Pumpkin seeds are able to reduce your LDL or “bad” cholesterol thanks to their phytosterols. These plant compounds can help reduce your risk of heart attacks and strokes. The Omega-3 fats in them also work to protect the heart from damage. 3. Reduced cancer risk –As Lisa Garber reports, antioxidants like beta-carotene, found in pumpkins and their seeds, are considered carotenoids, known for their ability to ward off cancer and even reverse skin damage. 4. Diabetes management and prevention – In addition to preventing colds, the zinc in pumpkin seeds can have “insulin-like effects” and help in the treatment and prevention of diabetes. 5. A good night’s sleep – Pumpkin seeds contain something called tryptophan, an amino acid that is converted to serotonin in the body. Serotonin is then transformed into melatonin, which is considered the “sleep hormone”. Adding them to your daily diet could help you in balancing your sleep-wake cycles and getting the most out of your downtime. Pumpkin seeds aren’t hard to come by and they aren’t expensive. With the wealth of health benefits in pumpkin seeds, you should definitely make sure you keep them in your kitchen cupboard.